1) Swifts spend almost their entire lives on the wing, and have been recorded flying without landing for at least 10 months! 2) Their Latin name is Apus apus, which literally means footless footless. This is because their legs are so short, people used to think they didn’t have any at all. 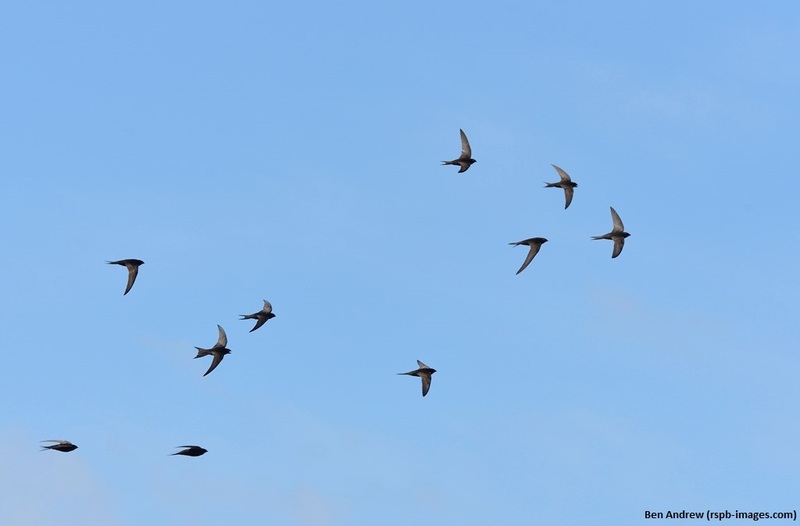 4) Swifts usually migrate back to the UK from Africa about a month later than swallows and house martins, and leave earlier as well, so enjoy them while they’re here! 5) Swifts can be identified by their screaming calls: it’s an iconic sound on a warm summer’s evening. 6) Swifts usually hunt at quite high altitudes, but in areas where they’re breeding, they can be seen at rooftop level or even lower in what are called screaming parties. 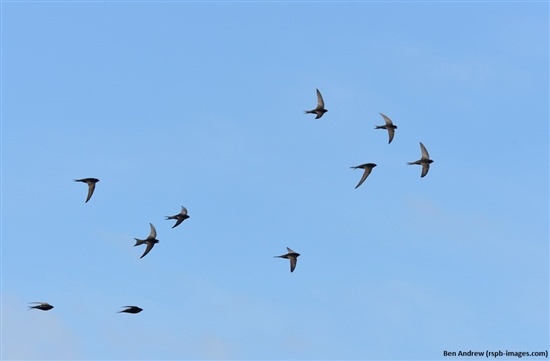 These are groups of swifts that call excitedly to each other as they perform breath-taking aerobatics around buildings at dusk. 7) You sometimes see them referred to as devil’s birds. Maybe people used to think all that screaming was spooky? 8) Swifts nest in holes and crevices, not in mud cups like swallows and house martins. They like old buildings and towers, anywhere where they can come out over a bit of a drop. 9) Adult swifts feed by scooping small insects and spiders out of the air. Parents mix their catch with saliva to form food balls to pass to their nestlings. Each of these food balls can contain 500 insects. 10) Swifts are now amber-listed birds due to a big fall in their population.